The land of various festivals and cultures; spirits of the people in India is majorly high throughout the year because of so many joyous celebrations. With the onset of the spring season, Hindu community observes their traditional New Year festivities under different names. Just like Baisakhi (Punjab), Bihu (Assam), Juir Sheetal (Mithila), Noboborsho (Bengal), Vishu (Kerala), Puthandu (Tamil Nadu), the Buddhists and Hindus residing in Odisha celebrates Pana Sankranti or Maha Vishuba Sankranti, their regional Odia or Oriya New Year. This year, Pana Sankranti also called Nua Barsa falls on April 14, as the first day of Odia calendar. The auspicious occasion definitely cannot be celebrated without the warm greetings of the heart of Odisha, sand artist Sudarsan Pattnaik. Just like all the other celebrations, Pattnaik once again created a beautiful sculpture wishing Odia New Year 2019 to all the people observing Pana Sankranti today. Sudarsan Pattnaik Creates Beautiful Shree Ram Sand Art to Celebrate Ram Navami. The festival date of Pana Sankranti is set with the solar cycle of the Hindu lunisolar calendar, as the first day of the traditional solar month of Mesha. Hence, every year, it falls on April 14 every year on the Gregorian calendar. 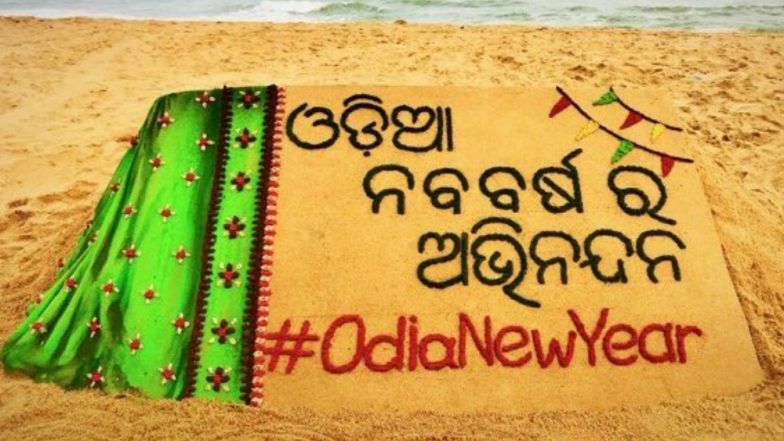 As the Nua Barsa festivity for the Odia community is here, the Padma Shri awardee had the best portrayal by the beach with accurate Odia fonts wishing, Happy Odia New Year 2019. Image Greetings, WhatsApp Messages And Stickers For Vaisakhi. Pana Sankranti is believed to be the birthday of the Hindu deity Hanuman, whose loving devotion to Lord Rama in Ramayana is legendary. The festival coincides with the birth anniversary of the Vishnu avatar, Rama, and people celebrates Ram Navami at this time of the year. People across the state of Odisha eat festive chhatua and drink Bel Pana, a sweet drink made from milk, ripe fruit of bel and spices on the occasion of Pana Sankranti. We wish all our readers a very Happy Odia New Year.